Eileen had a lovely listen to Cara’s new album for Irish Music Magazine. Here is what she had to say in their November issue. 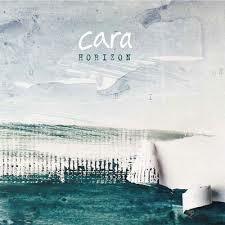 Horizon follows on from the acclaimed 2010 release Long Distance Love and what better way to depict the evolution of musical horizons then on the tenth anniversary year of Cara’s musical existence. The departure of the inimitable Jeanna Leslie has enabled the introduction of the Scottish based stalwart of gripping lyricism and piano forte that is Kim Edgar. The songstress fits well into the exuberant overriding personality that Cara emits through both its live gigs and recordings and her contribution to this album is that of lyrical depth. Illustrated in her compositional song Blood, Ice and Ashes which eloquently depicts the darkness of murder in the female form. The lead vocal is passed effortlessly between Edgar and Walther throughout the album as they take turns to showcase their expertise in song writing. A standout is Walther’s powerful opening vocal on the reflectively sentimental Be Gone and then the pureness of tone in Edgar’s vocal on The Bonnie Lad resonates as the strings lift the words of Robert Burns to sublime levels. The quality of arrangement on the instrumental tracks never falters, as shown by the blend of energetic sound on the Baby Steps to Whiskey set, as the increased pace is enhanced beautifully by the syncopated piano and pulsing Wagels bodhrán rhythm. Murphy’s full bodied musical intoxication of his, wine related, composition Echo Falls is a highlight in the driving Big Jig set and so is the inclusion of Cara’s Beoga buddies in the form of the diatonic box playing duo on the Masters of Consequence set. Treyz hits the high mark though, with his complicated compositional arrangement on Odd Rhythms which is so instrumentally involved it needs repeat play to fully appreciate the myriad of rhythmic phrasing within.